At our recent "Spring Fling" we were blessed by several wonderful springtime dishes to ring in the season of warm days and long growing season. Along with our BBQ brisket and wild hog, this creamed corn was cooked up by our beloved resident, Jackie, who definitely wins the "Martha Stewart" award at Hidden Valley. Her contribution was a crowd pleaser from first taste. This is the first in a group of shared recipes from our recent Spring Fling BBQ potluck. Mix corn, half and half, salt, pepper and sugar. 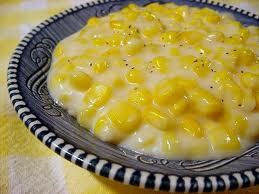 Bring to a boil, melt butter and mix with flour, add to corn and simmer. (That's simmer, not boil, dears...hehe) We kept it warm in a crock pot for a couple hours and it kept it's corny crunch. Could that be easier? Be creative, too and add some of your own favorite tastes: a few dashes of hot sauce, a small jar of pimentos for color, chopped parsley, a little parmesan...you get the idea. In the following posts we'll be sharing a grape salad surprise, a crispy oriental napa dish and peach empanada pockets, too.